This heartwarming Homecoming gathering features timeless songs sung around a cozy campfire and at a fun-filled picnic with some of gospel music's most beloved friends and their families. 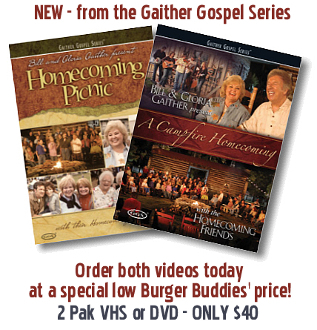 This newest Gaither project, A Campfire Homecoming and Homecoming Picnic filmed in Lebanon, TN at the Wilson City Fairgrounds/Fiddler's Grove , is available in DVD or VHS. Enjoy these once- in-a-lifetime moments with gospel music's most legendary voices featuring the Homecoming Friends. Artists include:The Gaither Vocal Band, Donnie Sumner, Squire Parsons, Russ Taff, the Booth Brothers, Gordon Mote, Karen Peck & New River, Larry Ford, Dottie Rambo, the Isaacs, Jeff & Sheri Easter, Jessy Dixon, the Hoppers, Eva Mae LeFevre, Lynda Randle, the Greenes, the Martins, Michael English and many more. Jesus Hold My Hand, Lead Me To The Rock, Mansion Over the Hilltop, Hold Me While I Cry, Unclouded Day, Sweet Forgiveness, The Holy Hills Of Heaven Call Me, Yes I Know, Sky Full of Angels, Palms of Victory, Mama's Teaching Angels How To Sing and many,many more.